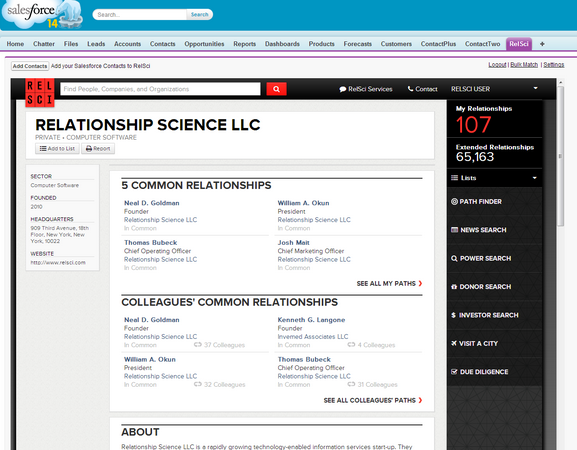 See how RelSci can help you acquire new clients and retain existing ones. Are you a Financial Institution? 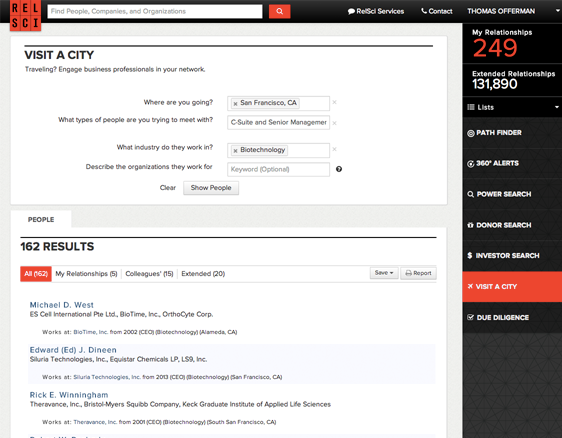 See how RelSci can help you leverage your firm's relationships and gain access to decision makers. Are you a Nonprofit? See how RelSci can help you shorten your fundraising cycles and identify high-impact donors. Path Finder and the other relationship mapping tools on the RelSci Platform give users the ability to run paths between any entity (person, place, list) to any other entity and get a sense of how they might be connected. There is no other functionality like it on the market. Over 50 search filters allow our clients to build customized target lists that identify high-profile targets based on a particular industry, geography, role, company type, cause, and many more criteria. Any list that is generated is run through a relationship filter showing if you know anyone on the list, if your colleagues do or if your extended network does. The RelSci Platform provides real-time, people-driven intelligence on over 9 million influential decision makers and over 1.7 million organizations across the public, private, financial and nonprofit sectors. 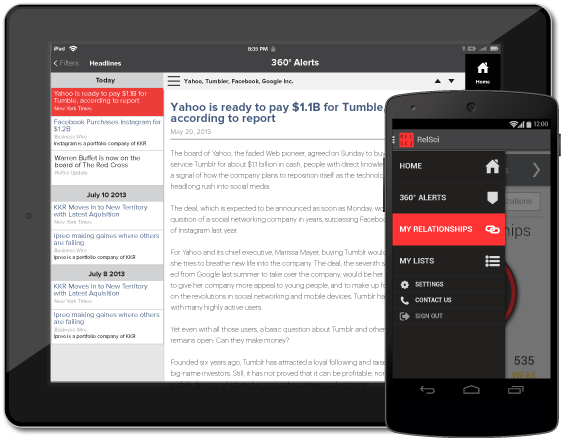 Our clients receive 360° Alert emails so they can stay current with the ones that matter most to them. Relationship Capital is about more than identifying and gaining access to key decision makers. It is also about the ability to look clearly at your organization's reach: what are its strengths, weaknesses and areas of opportunity when it comes to making key decisions. We are constantly developing new tools to help our clients. Access your RelSci account with our iPad, iPhone, and Android apps. Accelerate business development and increase access to key decision makers. We bring science to the art of business relationships. We believe "there's always a way." Investment Banking. Private Equity. Hedge Funds. Wealth Management. Corporate. Professional Services. Nonprofit. Law Firms. Customers. Clients. Prospects. Partners. Colleagues. Dealmakers. Investors. Influencers. Advisors. Donors. We have raised approximately $120 million from a group of well-known and highly respected individuals and institutions who range across the corporate and financial service sectors. RelSci was founded on a set of core beliefs. We take a practical approach to helping our clients’ business development efforts. We populate our platform with the most influential people and organizations in business, finance, law, politics, and the nonprofit sector. We have more than 9 million profiles of individuals and their organizations. We are not about connecting you to every person or organization in the world. Just the ones most important to you. User-generated content is, by definition, unconfirmed. We provide research-driven information aggregated from hundreds of publicly available sources. Our team of more than 500 researchers and developers works hard to ensure the cleanest possible data. Discovering relationship knowledge is a constant challenge. Resources are slim. Searches are insufficient. Sifting through volumes of extraneous information wastes time and resources. We streamline the process. Institutional-grade knowledge is almost always hard to access. We focus on creating an interface that is intuitive and easy to use, and available on many of your devices. It enables greater efficiency, effectiveness, and productivity. Mutually beneficial relationships start with understanding. Our deep profiles help you understand what makes certain people tick – their experiences, affiliations, interests, and relationships – and, most importantly, how you can access them. We built a platform that helps corporations, financial institutions and nonprofit organizations gain a deeper understanding of their relationships with influential decision makers - what we call their "relationship capital." Corporations : We work with law firms, accounting firms, consulting firms, marketing services and Fortune 1000 companies. Financial Institutions : We work with investment banks, private equity firms, wealth managers and hedge funds. Nonprofits : We work with cause-based organizations and higher education institutions. If you are a Fortune 1000 company, use the RelSci Platform to gain competitive advantage by mapping your senior leadership to key decision makers. "I've been using the tool a lot and finding it helpful in identifying contacts who may not otherwise be online." "We have been able to turn prospective leads into meetings using the platform. It has been exceptionally helpful." "The power of this system is awesome. But everyone will want to keep it a secret - because it will make you a networking ninja..."
Competitive situations that require access to a deal, capital or decision makers happen everyday. To act first it is essential that you can leverage your firm's relationship capital with decision makers. Houlihan Lokey Howard & Zukin Capital, Inc.
"In 3 weeks, I generated a deal that paid for your service for 10 years." "We are going to use this before every meeting we go to." "The amount of names and linkages is remarkable. The system makes many of the networking connections that we would be making anyway, but dramatically cuts down the time it takes to figure out who knows who." "Our board members had no clue they actually have these types of connections because there's no way for them to keep track of every board their relationships are affiliated to - this has been amazing for us!" "We have been able to pick up on board representation that we previously have not been able to find." "RelSci gives us confidence when asking a board member/donor for an introduction." Enter your email address to stay in the loop on all that is happening at RelSci. I authorize Relationship Science or its billing agent acting on its behalf to charge the credit card indicated in this authorization form according to the terms outlined above and in the subscription agreement that I or the entity I represent entered into with Relationship Science. I understand that this authorization will remain in effect until I cancel it in writing, and I, or the entity I represent agree to notify Relationship Science in writing of any changes in the account information or termination of this authorization at least 15 days prior to the next billing date. I certify that I am an authorized user of this credit card and that I and the entity I represent, if any, will not dispute the scheduled payments with my credit card company provided the transactions correspond to the terms indicated in this authorization form. The materials on this web site (the "Site") are provided by Relationship Science ("RelSci") as a service to its clients and investors and may be used for informational purposes only. Single copies of material contained on this Site may be downloaded for non-commercial, personal use subject to the provisions below and provided that you also retain all copyright and other proprietary notices contained on the materials. By viewing materials on this Site and/or downloading any materials from this Site, you agree to these terms. If you do not agree to them, do not use the Site or download any materials from it. Copyright © 2019 Relationship Science LLC. All rights reserved. The contents of these pages, including text and graphics, are protected by the copyright laws of the United States and other foreign jurisdictions. No portion may be reproduced in any form, or by any means, without the prior written consent of RelSci. For clarity, and without limitation to the foregoing, facts may also not be extracted from these materials and used for any commercial purpose. DISCLAIMER: THE MATERIALS ON THIS SITE ARE PROVIDED "AS IS" WITHOUT ANY EXPRESS OR IMPLIED WARRANTY OF ANY KIND INCLUDING, WITHOUT LIMITATION, WARRANTIES OF MERCHANTABILITY, NONINFRINGEMENT OF INTELLECTUAL PROPERTY OR FITNESS FOR ANY PARTICULAR PURPOSE. IN NO EVENT SHALL RELSCI, ITS AFFILIATES, OR ITS SUPPLIERS BE LIABLE FOR ANY DAMAGES WHATSOEVER (INCLUDING, WITHOUT LIMITATION, DAMAGES FOR LOSS OF PROFITS, BUSINESS INTERRUPTION OR LOSS OF INFORMATION) ARISING OUT OF THE USE OR INABILITY TO USE THE MATERIALS ON THIS SITE, EVEN IF ADVISED OF THE POSSIBILITY OF SUCH DAMAGES. THE ABOVE LIMITATION OR EXCLUSION MAY NOT APPLY TO YOU. RelSci and its affiliates assume no responsibility, and shall not be liable for any such damages to or viruses that may infect your computer equipment, software, data or other property on account of your access to, use of, or browsing in the Site or your downloading of any materials, data, text, images, video or audio from the Site or any linked sites. RelSci, its affiliates, and its suppliers further do not warrant the accuracy or completeness of the information, text, graphics, links or other items contained within the materials posted, set forth, downloadable or linked to this Site. RelSci may make changes to any or all of these materials, or to the products described therein, at any time without notice. RelSci makes no commitment to update the information on this Site. The information provided on this web site by RelSci. speaks only as of the respective dates on which the information was first created. This information can become out-of-date. RelSci makes no commitment, and disclaims any duty, to update any of this information, except as expressly stated on this Site. Any material, information or other communication, including, without limitation, data, questions, comments, suggestions or the like (collectively, the "Communications"), that you transmit or post to this Site will be considered non-confidential and non-proprietary. RelSci will have no obligations in connection with any of the Communications. Furthermore, at the sole discretion of RelSci, the Communications, including all data, images, sounds, text and other things embodied therein, may be edited by or on behalf of RelSci, may or may not be posted to this Site and may be used by RelSci or its affiliates for any purpose, including, reproduction, disclosure, distribution, transmission, publication, broadcast and posting. The Communications may be used for any and all commercial or non-commercial purposes including, but not limited to, developing, manufacturing and marketing products using such information. You are prohibited from posting or transmitting to this Site any Communications that are unlawful, threatening, libelous, defamatory, obscene or pornographic or that would otherwise violate any law. In addition, you are prohibited from posting or transmitting any material that could constitute or encourage conduct that would be considered a criminal offense or give rise to civil liability. RelSci hereby notifies you that it will cooperate fully with any law enforcement authorities or court order requesting or directing RelSci to disclose the identity of or help identify or locate anyone posting any such information or materials. The linked sites are not under the control of RelSci and its affiliates and neither RelSci nor any of its affiliates is responsible for the content, including, without limitation, the truthfulness or accuracy of any statement or other content, of any linked site or any link contained in a linked site. RelSci reserves the right to terminate any link or linking program at any time. RelSci has not reviewed all the information contained in the linked sites and does not endorse the companies, products or sites to which it links and reserves the right to note as such throughout the Site. If you decide to access any of the third party sites linked to our Site, you do this entirely at your own risk. This site is controlled by RelSci from its offices located in the State of New York within the United States of America. Neither RelSci nor any of its affiliates make any representation that materials at this Site are appropriate or available for use outside the United States, and access to them from territories where the content of this Site is illegal is prohibited. While this Site may be viewed internationally and may contain references to products and services not available in all countries, such references do not imply that RelSci or any of its affiliates intends to make such products or services available in such countries. You may neither use, export or re-export the materials at this Site, nor may you use any copy or adaptation of such materials, in each case, in violation of any applicable laws or regulations, including, without limitation, United States export laws and regulations. RelSci may revise these terms at any time by updating this posting. You should visit this page from time to time to review the then-current terms because they are binding on you. Certain provisions of these terms may be superseded by expressly designated legal notices or terms located on particular pages at this Site. RelSci collects information that you voluntarily provide to us, including your name and contact details. We may collect information about your visits to our websites, including the pages you view, search terms you enter, and other actions you take in connection with the Site and other RelSci services. We may also collect certain information from the browser you used to come to our website, such as your Internet Protocol (IP) address, browser type and language, access times, the Uniform Resource Locator (URL) of the website that referred you to our website and to which URL you browse away from our site if you click on a link on our site. When you visit the Site, we may send one or more "cookies" (small data files) to your computer to uniquely identify your browser and let us help you log in faster and enhance your navigation through the Site. A cookie may convey anonymous information about how you browse the Site to us, but does not collect personal information about you unless you are an subscriber to the service in which case your name may be included in the cookie to facilitate faster access to the Site. A persistent cookie remains on your computer after you close your browser so that it can be used by your browser on subsequent visits to the Site. Persistent cookies can be removed by following your web browser's directions. A session cookie is temporary and disappears or becomes inactive after you close your browser. You can reset your web browser to refuse all cookies or to indicate when a cookie is being sent. However, some features of the Site may not function properly if the ability to accept cookies is disabled. Your information will be held by RelSci in the United States and may also be held and accessed by RelSci staff and third parties working for RelSci, or RelSci's subsidiaries and affiliates, inside and outside the United States. If your information is gathered outside the United States, it may be transferred to RelSci's United States offices to be used for these purposes, and it may be transferred to and shared with any of RelSci's worldwide locations. You may request a full list of all subsidiaries and affiliates of RelSci. Non-Personally Identifiable Information: We may share non-personally identifiable information (such as anonymous usage data, referring/exit pages and URLs, platform types, number of clicks, etc.) with interested third parties to help them understand the usage patterns for certain RelSci services. RelSci uses commercially reasonable physical, managerial, and technical safeguards to preserve the integrity and security of your information. We cannot, however, ensure or warrant the security of any information you transmit to us or guarantee that your information on the Site may not be accessed, disclosed, altered, or destroyed by breach of any of our physical, technical, or managerial safeguards. You may, of course, decline to submit personally identifiable information through the Site, in which case RelSci may not be able to provide certain services to you. You may update or correct your account information and email preferences at any time by logging in to your account on the Site. All comments, queries and requests relating to our use of your information are welcomed and should be addressed to the following e-mail address privacy@relsci.com or to Legal Department, 5 Pennsylvania Plaza, 15th Floor, New York, NY 10001.